No one not even Stanley Matthews, was quite ready for what was in store for the England team when they met Czechoslovakia at White Hart Lane on 1st December 1937. The Czechs had come to the European international scene fairly late as football continued its march across the continent. Their first match had been in 1920 against Yugoslavia, but since then they had grown into a formidable side and were the only team, apart from England, who had beaten the Austrian “Wunderteam” who dominated Europe at the time under English coach Jimmy Hogan. Czechoslovakia, Austria and England were also the only teams to have beaten Italy, the World Cup winners in 1934, during the early Thirties. In fact, when England went to Czechoslovakia in 1934 for the first time, they had come away defeated 2-1, only the third defeat by a team from outside the British Isles in England’s history. But in the second half of the decade, defeat in Europe became commonplace for England and by the time of this return friendly, had been beaten by Belgium, Austria, Switzerland and Yugoslavia. And at home, Wales had had the upper hand in the UK; since 1932 they had won the Home Championship three times and come second once. The FA Selection Committee continued the habits of the Twenties. An England cap was more an honour for good service than part of a coherent attempt to build a consistent side, and it was still common for players to meet for the first time in the dressing room just before kick-off. The England side for this match was a raw one, with only Arsenal half-back Wilf Copping having more than ten caps. He and Stanley Matthews were the only players remaining from the 1934 match, and other England regulars Cliff Bastin and Eddie Hapgood, the usual captain of the time, weren’t available. The Czechs, in contrast, had a squad system in place with a regular coach, Karel Petru. Oldrich Nejedly and Antonin Puc in attack, and Josef Kostalek in defence had all played in the Prague match. Also there had been Frantisek Planicka, probably best goalkeeper in the world at the time. But at the same time, three months earlier the Czechs had been humbled by Hungary in an 8-3 win. 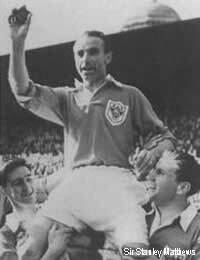 Gaining his sixth cap, Stanley Matthews was keen to put in a good performance after not doing so well during his last England appearance at White Hart Lane, a 3-0 win against Germany. Things went well initially with Jack Crayston scoring in the tenth minute, but legendary Czech striker Antonin Puc levelled four minutes later. Then in the 18th minute Jack Morton scored to make it 2-1 to England, but was injured and had to move out to the wing. At the same time, George Mills, the centre-forward, was injured, and, as substitutes weren’t allowed, Mills moved out to one of the wings too, largely a passenger, and Matthews moved to inside-forward. Injury also hit Jack Crayston Morton, who then had to take turns resting out on the wing. Despite this, Matthews managed to open his account in the 28th minute and England would have gone in at half-time 3-1 up had it not been for a brilliant goal by Oldrich Nejedly a minute beforehand. The Czechs were causing England big problems with their neat inter-passing and although Matthews increased the gap with a goal on 57 minutes, Josef Zeman (65) and Nejedly (76) made it 4-4 with a quarter of an hour to go. Five minutes later Matthews dribbled towards the goal and took a shot with his left foot which the keeper appeared to have covered, but a deflection off the right-back Kostalek sent it in. Contemporary newspaper reports said that this was the best performance by a Continental side seen in England to date, and the Daily Express said that the moment Matthews took over at inside-forward he was transformed. Matthews was pleased to have put in a good performance, his first and only England hat-trick, and with all the goals scored with his left foot, generally considered only good for standing on! None of the injured players appeared for England again. Puc’s opening goal for Czechoslovakia was his 34th and last, which set a Czech international goal-scoring record which still stood when the country separated into the Czech Republic and Slovakia in 1993. The goalkeeper Planicka would go on to play against Brazil in the 1938 World Cup with a broken arm! The Czech’s continued their tour with a match against Scotland a week later and were beaten 5-0. This is still on record as the worst defeat in their history, jointly with the 8-3 defeat by Hungary.